One of the most enduring tales within the Amar Chitra Katha (ACK) family is that of founder Anant Pai, sitting among children, reading from one of the much-loved comic books, and enthralling his young audiences. It is, therefore, fitting that as ACK prepares to celebrate its golden jubilee next year, it is in the process of retracing its steps to what Pai held close to his heart, and was so good at—old-fashioned story-telling. Those within the company point to Biyani’s attempts at producing films—Na Tum Jaano Na Hum (2002), starring Hrithik Roshan, Saif Ali Khan and Esha Deol—as indicative of his inclination towards creative ventures. But, creativity apart, the founder and group CEO of Future Group, which owns hypermarket chain Big Bazaar, is also said to have a deep love for everything Indian. And what can be more Indian than Amar Chitra Katha, which has also been published in more than 36 languages and distributed in 12 countries. It would be interesting to see what this renewed focus does to a product that, without any marketing push, has managed to sell an average of 5 lakh copies every month since 2013-2014. This shift in approach, however, has meant a rejig within the Future Group departments that have been trimmed—many of ACK’s old-timers are no longer with the company—to make them more agile, to flatten the hierarchy within teams and increase interactivity between them. Agarwal himself divides his time between handling mergers and acquisitions, and managing ACK, a job that he seems to thoroughly enjoy. “Where else can you read comic books as part of your job?” he laughs. Agarwal says there is a “contra-trend” among readers who want their children to read more of Indian content rather than Western. “People want their children to be familiar with their roots,” he says. This is exactly what had prompted Uncle Pai to start Amar Chitra Katha in the first place. The legend goes that Pai, who passed away in 2011 at the age of 81, and his wife Lalita were walking along Delhi’s Karol Bagh area when they came across a shop where a quiz show was being telecast on TV, still a novelty in India. As they joined the small crowd gathered outside the shop to watch the programme, the quizmaster asked: “Who is the Greek god of the seas?” One of the teams answered, “Poseidon.” However, the next question—“Who is Ram’s mother?”—stumped the participants. Pai saw such uncertainty about India’s mythology in his nephews and nieces too. He realised that youngsters in India were growing up on a diet of Western culture and information, and remained oblivious to the riches of India’s mythology, heroes and legends. Thus began his lifelong endeavour to tell the country’s greatest stories to its children. Pai had worked with the books division of Bennett Coleman & Co, when they had launched Mandrake and Phantom under the Indrajal Comics series in 1964. With the urge to start a series on Indian comics, he approached the Mirchandanis of India Book House (publishers and distributors of books and magazines since 1952), who agreed to become distributors of Pai’s comic books. 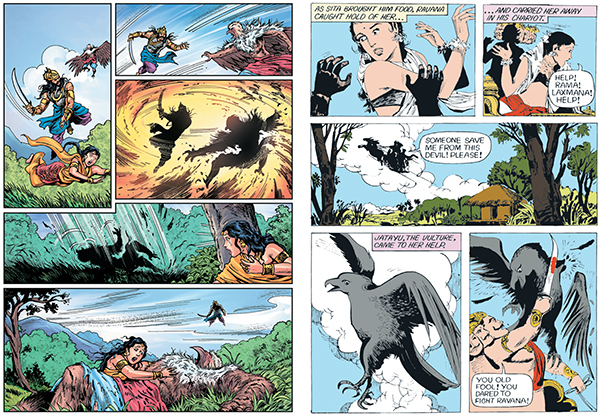 Thus, Amar Chitra Katha was born in Mumbai in 1967. “They agreed to give Uncle Pai a space to work in and also promised to print what he created, although, at that time, they did not pay him a salary,” says Puri. The first title to be published—scripted by Pai, and illustrated by another much-revered name, Ram Waeerkar—was Krishna, in 1970. __PAGEBREAK__After struggling for the first five years—during which Pai took to the road with a suitcase full of comic books every day, even putting up display shelves in bookshops—ACK started breaking even and gaining popularity. By 1980, ACK had published 400 titles, covering mythological tales, historical figures and modern-day legends. What became one of the defining characteristics of these publications—apart from their iconic artwork and narratives (see: The art of the matter)—was the research that went into each story. And although there have been tweaks to artistic styles over the years, the effort to gather accurate information holds as strong today as it did then. This process of research takes on a more personal approach whenever ACK writes about modern-day heroes. “We have to get the consent of their families, because we need details and snippets that only a family member or a close friend can give. These are the small details that make a story more appealing to children,” says Puri. So, it becomes necessary to figure out what the protagonists of these stories were as children, what they ate, what they wore. “It is even important to understand what the walls of their childhood homes looked like,” says Puri. When ACK came out with their book on Mother Teresa in 2010, for instance, the Missionaries of Charity (the organisation she had founded in Kolkata) did not agree to give formal interviews, but said they would rather show by their work what Mother had taught them. “Shalini Srinivasan, the scriptwriter, volunteered and stayed with the sisters and, while they worked, they shared the most delightful stories about Mother,” says Puri. ACK readers have almost felt entitled to make such demands. “There was a time when, for Tinkle, we would get more than 10,000 letters every summer, when schools closed and children got the time to write,” remembers Puri. “And these letters, scrawled by children, were often on scraps of paper torn off note books.” The letters included stories, jokes, and sometimes even complaints about parents not understanding them. They regarded Tinkle and Amar Chitra Katha as a friend and felt free to confide in their Uncle Pai. Today, this fan following has been transported to ACK’s Facebook page, which has more than 1.69 lakh ‘likes’. “Even today, we get suggestions about the stories that we should work on and publish, along with some researched material as well,” says Sanjana Kapur, assistant editor at ACK. “There are even arguments that break out among different readers, but we stay out of that.” This increased engagement is hardly one-sided: ACK regularly posts quizzes and competitions, interesting videos and nuggets of information on the page, keeping up a constant flow of engaging content. But involvement with readers—who, by now, span a few generations—is not just an online activity. Uncle Pai’s fascination for telling stories to children and holding quiz contests has endured through the years. ACK is a regular at events such as Bookaroo (Delhi), World Book Fair, Comic Con (Delhi, Mumbai, Bengaluru), Dehradun Festival (though not every year) and Ghumakkad Narayan in Dehradun, where they put up stalls, hold workshops and contests. This is where the generations-wide readership becomes even more obvious. “We see parents competing with their children, and scrambling to answer questions and win contests,” laughs Puri. But ACK’s tie-ups are not being used to simplify complex topics alone. In 2014, it joined hands with Kellogg’s and featured Coco, a character developed by the cereal company, in Tinkle comics, along with ACK’s own Kalia, Doob Doob and Chamataka. “In 2014 and 2015, we brought in Shikari Shambu, our other top favourite character, into the mix and for three years now, these four-page stories and associated contests have been featured in the monthly Tinkle magazines,” says Agarwal. Like the Indian culture it has aimed to portray, ACK has evolved over the decades by imbibing changes appropriate to the times. While it is yet to be seen how Suppandi and Shambhu fare in their commercial avatars, their comic-book selves remain ever popular. For, whether or not Amar Chitra Katha can help sell detergent, it still can tell a really good story. Older Ramayan scene: Artwork by Pratap Mulick and New Ramayan scene: Artwork by: Arijit Dutta Chowdhury. Mascarenhas adds that the earlier artists were freer in expressing human forms, whereas morality began to creep in only with the later ones. “We have seen the later artists adding dupattas to cover the figures of women,” he laughs. There is a conscious effort to not make the artwork monotonous. For instance, for the recent series on winners of the Param Veer Chakra (comprising 21 stories), each story has been illustrated by a different artist to ensure variety and distinct styles. Puri adds that the decision to bring about these changes began with Uncle Pai himself, who felt that the publication, because of its popularity, was being given a huge responsibility. “ACK had not just become popular; it was being held up as something a child could pick up and read. Therefore, the decision was taken to hold back some stories that were not appropriate,” she says. She refers to the story of Ranak Devi, in which a woman, whose husband is beheaded, follows the killer pleading with him to give her the severed head so that she can commit sati along with it.